I saw this flyer today at the Triangolo Pizzeria as I was headed to Manhattan to meet up with my mother and cousin. This is the kind of thing that makes a person think. Not only was this woman killed at a point in her life when she would otherwise have a long and bright future ahead, but it made me feel really sad to think about the pain her parents (and loved ones) are undoubtedly going through right now. I was alive to see my mother today, she wasn’t: because someone was clearly too drunk or too worried about going to jail to face the consequences of his (or her) actions. This is not cool. I for one hope this person gets caught. 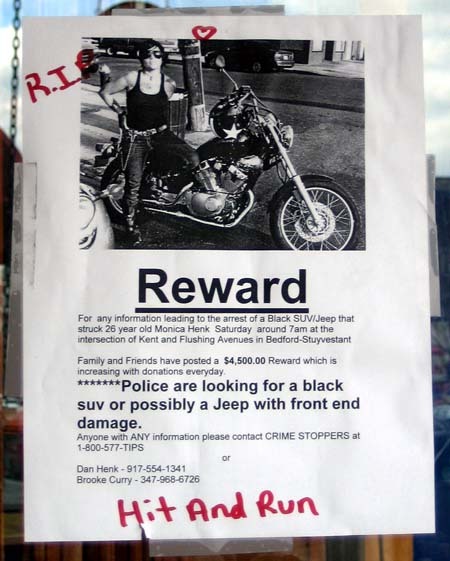 Sure, it won’t bring Ms. Henk back, but at least it will give some kind of closure to the people who loved her enough to trek all the way up to Greenpoint to put up this poster. They haven’t found the murderer yet and just to let you know the reward is up $20,000. Check DanHenk.com for updates on this matter.